Featuring over 125 pieces of Tiffany style glass, this Robert Louis Tiffany pendant chandelier is hand-assembled using the copper foil soldering technique. The bold Tiffany style shade of this 3-light pendant is made of multi-color art glass in an interlocking-circles pattern, against a cream glass background. Tiffany style glass is assembled using the classic copper foil soldering technique. The art glass shade is comprised of over 125 individual pieces of glass. Bronze downrods are adjustable and lead up to a bronze round canopy. 20" wide x 8" high. Weighs 11 lbs. Canopy is 5 1/4" wide. Includes one 6" and three 12" downrods. Uses three maximum 100 watt bulbs (not included). Made with over 125 pieces of Tiffany style glass. 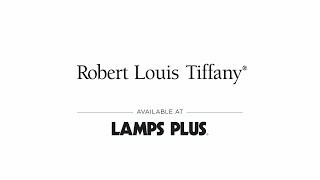 From the Robert Louis Tiffany brand. Pendant chandelier has a bronze finish frame. White glass diffuser. matches other craftsman style décor in my home. Perfect style, size and great price. Can't wait to get it installed to compliment the dining room. Fits décor. Unusual design and style. Tired of the chrome and white globe lights. So unique and a great price. Love it!! I'm so excited that this is finally on sale! I've been watching it for months. It will be perfect over our breakfast room table and will coordinate well with a Quoizel Tiffany floor lamp and Tremont floor and table lamps by Franklin Iron Works, all of which we bought from Lamps Plus for our connecting family room. The Franklin Iron Works lamps are especially beautiful. I have a drum light very much like this one and just love it. A slightly different design will be great to have. It will match my decor perfectly. I love the Tiffany style. Will use over my new Dining Room table. Have other geometric and Art Deco lighting all through my home. BEST ANSWER: I am sorry, the matching mini pendant has been discontinued and inventory is not available. is this light fixture good for over a countertop that extends for a breakfast bar? BEST ANSWER: It’s not clear how big an area you want to light. This chandelier is perfect over my breakfast room table, which is 40” x 60” or 70”, if the leaf is used. 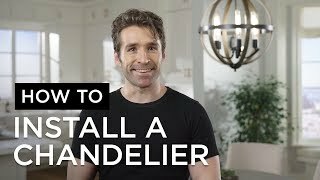 If you don’t have a similar size, I’m afraid the light fixture will look too big. It’s a substantial size. It should be lovely over a breakfast bar or just about anywhere. Mine is gorgeous hung from the center of the ceiling in a guest bathroom. This light fixture will make a statement in any room. Should be. Puts out nice light. We have it over a circular table in an open area. Yes, Really love our fixture. Our light is over a dining room table. 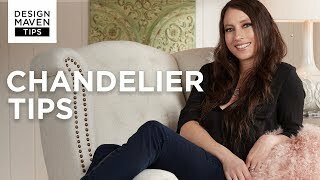 I really want this chandelier but have a slopped ceiling, is there any way to adapt it? BEST ANSWER: I am sorry, we do not offer any accessory to adapt it for a slope ceiling. Is the top side of the drum open or also have some kind of diffuser? Wondering if there’s a lot of light loss out the top of the drum. BEST ANSWER: Hi, the top of the light is opened. We actually added a second over our dining room table with 8' ceilings and find that it can be warm or bright depending on how we utilize our dimmer. the top side is open with no type of diffuser....its were you get about 60% of the light it produces. because you don't stare directly at light bulbs it makes a pleasant viewing experience..
Top is open, installed in master bed. Light on the ceiling. It’s open. Lots of light out the top. I have eight-foot-high ceiling and I was wondering if this installable in this context? BEST ANSWER: Hi, this chandelier includes one 6" and three 12" downrods. You can adjust the length to the height that you need by using the downrods provided. I do too, and it definitely can, and looks great! We have a smallish kitchen with an eat-in area. We're looking for something to go over the kitchen table. This looks lovely, but I wonder if it would be too large or dominating for a smallish space. Hi, this ceiling light is ideal for a room that is 10'X10' or 12'X12'. Can this be mounted to a sloped ceiling? BEST ANSWER: This cannot be installed in a sloped ceiling. BEST ANSWER: Yes, you can use this design with a wall dimmer. We have two over our dining room table, and the dimmer works very well. Yes, we have ours installed with a dimmer. 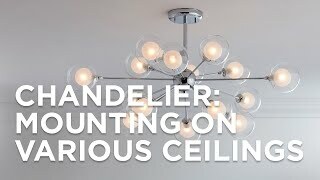 Lamps Plus staff: Will this light fixture ever go on sale? I’ve been watching it for quite a while. Thanks. Does this light come in 24"? BEST ANSWER: This pendant is not available in 24". BEST ANSWER: Yes, the diffuser is made of glass. BEST ANSWER: To change the light bulbs you will have to reach from up above. Anything to disconnect or just reach in to unscrew old and screw in new? I only have one good hand so I want something I can do myself! Should have worded my question better! No need to disconnect anything. Just make sure the power is turned off to avoid getting shocked. You can access the bulbs from the top. Depending on how high it is hanging, you may need a stool or chair to do so. BEST ANSWER: Unfortunately, this pendant is not UL listed. I have a 9-foot ceiling. I want to hang this over my breakfast room table. Are the included downrods adequate? Do I hook them together? BEST ANSWER: Yes, for a 9ft ceiling the included down rods will be more than enough. There are 3 x 12" and 1 x 6" and you just thread them together to your desired length. can you add more down rods? I have a 17' ceiling. Can additional rods be purchased for installation on a higher ceiling? BEST ANSWER: You can indeed buy additional downrods for this pendant. Below I have included the style number to a 12" inch downrod that will work and matches the finish of this light. Since it is a special order part, we will need for you to call in and place the order over the phone. Sorry. I don't know. Find out who the manufacturer is and check with them. I hung this high above our dining room table, and installed a dimmer with it. I used the 6" downrod, which, BTW the downrods are well-made with a ball-bearing joint that self-corrects any imbalance. The glass is so beautiful, as the design shimmers and glistens when lit. The diffuser on the bottom makes it possible to hang high, without having to see exposed bulbs. Very classy. It can take the equivalent of three 100w bulbs. I am using three 60w bulbs and the lighting is bright(actually, I'm using three 13.5w LED bulbs).It is on the heavy side, so make sure the bar in your ceiling from which it will hang, is secured. 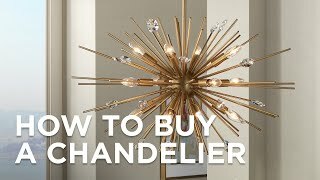 We purchased this lamp when it was on sale so that was wonderful! It is very stylish, perfect lighting for over our table we eat at, blends in with our surrounding family room and kitchen decor (barnwood beams and eclectic), but it also stands out in a great way! Love the design, colors, and the drum style. The only think so far that we've noticed but it's becoming less obvious is in some of the places where the sodder meets other sodder - it looks like blobs of sodder. Not sure if every lamp has this problem. We liked it enough to keep this one. Very satisfied, plan to purchase more lamps from LampsPlus! Very helpful and curteous staff too! This lamp hangs in my dining room in my farm style house. We have stone floors and granite countertops. It is elegant and looks like it came from an antique shop. 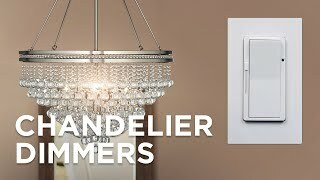 No one can believe it came from LampsPlus. We have it on a dimmer switch and it is perfect dining light for all times of day. 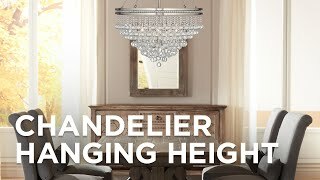 Beautiful chandelier, provides great light and is well made yet delicately put together. Very warm and attractive design, looks beautiful over my table! It's a beautiful focal point in our great room and has become a conversation piece with friends. It's a perfect combination of traditional and contemporary. We have other Tiffany lights in our house. I went online to find a drum light to replace a chandelier we had. I got so lucky to find a drum light and Tiffany light that looks beautiful above our table in the kitchen. Bought this light to hang over dining room table. It just adds so much character to the room. Delivery was prompt, lamp well protected. It would be better if a material other than styrofoam could be used for packing. I had plans to replace table for an updated one but the lamp steals the show!! An instate update worth every penny!!! Used over kitchen table. Kitchen table is in nook surrounded by window seat and 2 bookcases. Makes a beautiful vignette!!! Delivery was on time and there were no problems. I picked this light to bring some modern style to a dining room with antique oak furniture. It looks great. The colors in the shade repeat colors in our decorating scheme so it was a perfect choice. Another reason to like is the three 100 watt bulbs give excellent illumination. Also to mention: The light comes very well packaged for a safe delivery. The chandelier is in our dining room and it adds a very nice touch to our decor. Beautiful! Well made! Good buy! We really like our new light. It's unique, works so well and is clearly a quality product. Lamps plus had a huge variety in the store for every place in my house and I will be back for more lamps?? The chandelier looks so elegant in my kitchen and ties everything together perfectly?? 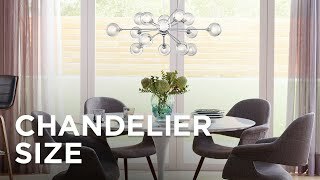 We bought one of these to hang over our new dining room table, but once it was installed we realized it only illuminated half of the table and part of our dining room, so we ordered a second one to balance everything out. We love the art deco style of the chandelier, and how it brightens up our newly remodeled dining room. This Tiffany dinning chandelier is Fabulous. Colors are beautiful. This is absolutely gorgeous. We hung it in our breakfast room, which connects to our kitchen and family room. It coordinates beautifully with everything, including the wonderful Franklin Iron Works Tremont table lamp and floor lamp we bought recently. It’s lovely when it’s turned off, but the colors come alive when it’s on. Great quality and stunning accent to our furniture and hardwood floors. This is the perfect lamp for our dining area. The colors and style blend in so well with our 48" round copper top dining table. The stained glass motif provided the right blend of elegance and modernity. Very happy with this purchase! Photos don't do this lamp justice. We bought this lamp based on the reviews here. Believe them. Photos don't do this lamp justice. Even the electrician who installed the lamp remarked on how beautiful it is. Beautiful fixture. Just like internet. Went to local lighting showroom & viewed drum fixtures by same manufacture. Saw quality of construction. Love the globe cover. Does not reveal bulbs, but directs light & opaque hue. Warm and refinedthis six-light Blue Tiffany-Style tiger bronze pendant light is perfect for entrywaysdining roomsgame roomsand more. Three Tiffany style art glass shades in warm red and yellow hues give this chandelier an inviting look and feel.